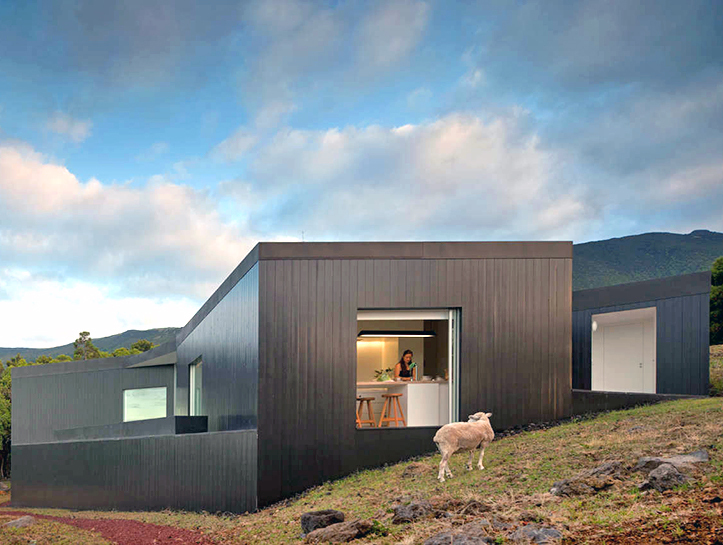 Blackened timber clads the C/Z House, a minimalist structure with stunning views of the Portuguese island of Pico. 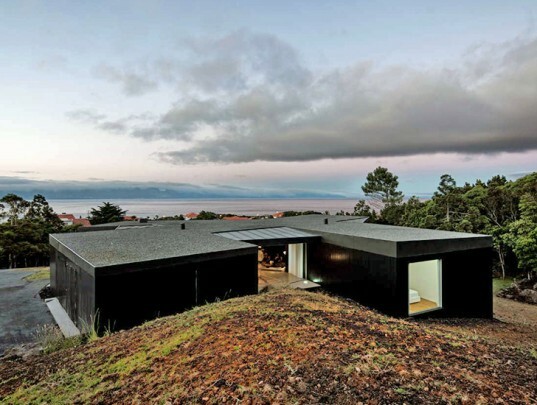 Designed by SAMI Arquitectos, the house is located at the highest point of São Roque do Pico. The prefabricated building earned an A+ rating for its energy efficient systems. Built into the hilly terrain, the C/Z House is divided into four rectangular volumes that connect at the center with a glazed living room. Its irregular shape was created to take advantage of views in different directions, from the coastline to the north to the open fields with grazing sheep. The glazed openings also allow for natural ventilation to flow through the house. In contrast to the black timber facade, the interior is finished mostly in white with a few black wall accents. The modern and minimalist interior is filled with natural light and keeps the focus on the rich outdoor landscape. The bedrooms and bathrooms are located in two of the rectangular wings. The two other wings contain a garage and the kitchen and dining room. Built into the hilly terrain, the C/Z House is divided into four rectangular volumes that connect at the center with a glazed living room. Its irregular shape was created to take advantage of views in different directions, from the coastline to the north to the open fields with grazing sheep. The glazed openings also allow for natural ventilation to flow through the house. In contrast to the black timber facade, the interior is finished mostly in white with a few black wall accents. The modern and minimalist interior is filled with natural light and keeps the focus on the rich outdoor landscape. The bedrooms and bathrooms are located in two of the rectangular wings. The two other wings contain a garage and the kitchen and dining room.